Raspberry Pi cases suitable for your unique set of accessories are difficult, if not impossible, to find. Making your own case with a 3D printer immediately comes to mind, but the task of designing and printing a case has its own set of difficulties and challenges. Moreover, you might not be able to purchase a 3D printer because of cost, the need for dedicated space, or the knowledge required to select a suitable printer. If you have access to a printer or a printer service, though, a little planning can help you achieve the goal of printing a customized case. In this article, I show you how I planned and designed a case for a Raspberry Pi with a 2.5-inch hard drive plus powered USB hub (Figure 1). Figure 1: This Raspberry Pi and its accessories need a customized case. The standard cases for the Raspberry Pi are usually as minimalist in their design as the devices they house; their form is definitely driven by function. Connections for the Rasp Pi are distributed over each edge of the circuit board. Therefore, a minimalist case is the only one that allows the Rasp Pi to fit inside easily. Placement of the connections proves to be one of the biggest obstacles when selecting a larger case that also has space for accessories. Once you manage to find a case large enough, it reduces external access to the connections to a maximum of two sides. The Raspberry Pi 2 (RPi2) is more amenable than the RPi1 to limiting the connections to two sides. Whereas a short edge of the board still has the USB and Ethernet ports, which will accommodate the connection to a USB hub (data link), the power supply has been moved from the other short edge on the RPi1 to the long edge next to the HDMI port on the RPi2 (Figure 1). Having cables come out of multiple sides is one obstacle to finding an appropriate case. In a custom case, it would make sense to use short cables internally, but these are practically impossible to find. The surplus lengths of the cables monopolizes space inside a case. As an aside, various cables are available with right-angle plugs for USB connections that are well suited for the task at hand and are relatively short in length. They come in lengths of 6 to 10 inches and can help reduce the space needed inside a case. 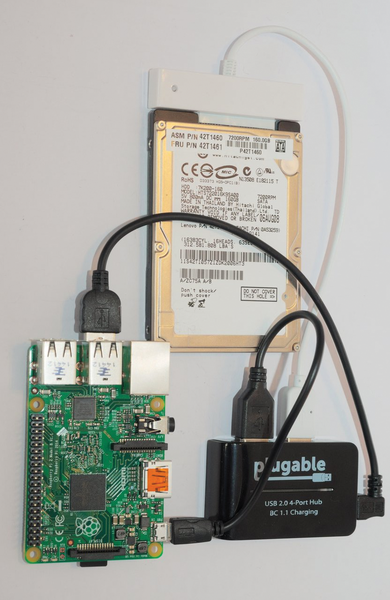 A Raspberry Pi cannot provide power to a 2.5-inch hard drive sufficient to guarantee stable operation; however, a powered hub can supply power to both the Raspberry Pi and the drive while avoiding the extra wiring that would otherwise be needed to both components separately. Strictly speaking however, this setup does not meet USB specifications. Luckily, some devices are generous in the power they supply and deliver more than the 500mA required. 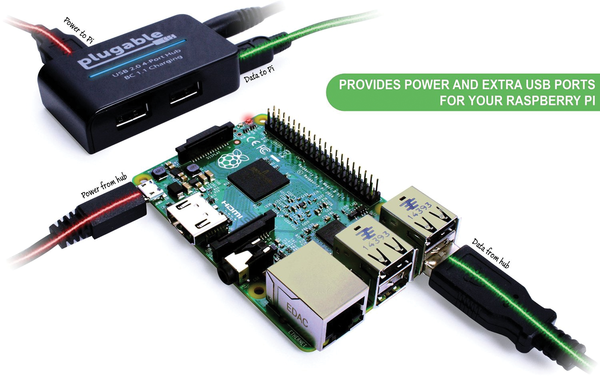 The manufacturer Plugable advertises for exactly this scenario  by offering a USB hub with four ports for simultaneous power and data connection to the Raspberry Pi (Figure 2). Another advantage of the pluggable hardware is that its ports face in two directions, which means it is possible to have two ports facing inside the case and two facing outside. However, it also means that the uplink connection (green line from the hub), which would preferably be on the side facing into the case, and the power jack, which would preferably be on the side facing toward the outside of the case, will face the same side. Compromise is a part of life. A simple SATA USB adapter completes the ensemble; the network cable will be threaded through a gap in the Rasp Pi. Although not an ideal solution, the extension cables are simply too long for any other solution. As soon as all of the components are lined up and ready for use, it is time to figure out an optimal shape for the case.